I couldn’t believe it when I read it. It was announced today (8/28/12) that the Obama administration has mandated a 54.5 mpg CAFE (corporate average fuel economy) standard by 2025. The funny thing is, I was just thinking how the 35.5 mpg CAFE standard, which will be enforced by 2016, was already going to change the auto industry, the types of cars we drive, and what its going to do to enthusiasts like us. But, this 2025 standard is far more draconian. Frankly, I’m shocked and confused. I don’t see how anyone would come up with this unless they were an environmentalist – and not just a casual environmentalist, a full out extremist. Reading over the article found on the EPA’s website, I feel that the accolades given to this mandate are completely disingenuous. Where do I start? “[The increase cost at the dealer will be offset by lower prices at the pump. ]” I guess the Transportation Secretary, Ray LaHood, doesn’t take into account how free markets work. I would assume that the oil companies will always set the price of oil to what the market will bear. If we reduce our demand for oil, they will reduce the supply to avoid creating a surplus. That means the price at the pump will continue on its current trend. Furthermore, the price at the dealership may be so high that it will never be offset. This is pretty much typical with anything ‘green’. The only reason why hybrid cars can exist right now is because they are subsidized. ” …the single most important step we’ve ever taken to reduce our dependence on foreign oil.” This is completely false. Reducing the amount of oil we use doesn’t mean that we are not going to buy it from foreign sources. Even though we would buy less oil in volume, the price of that oil will increase so those evil regime’s will still be able to fund their evil deeds. “…its good for middle class families.” While reading some of the comments left on major news sites about the 54.5 mpg regulation, I came across a very ignorant comment. It went something like “[If we can build a fighter jet that can be flown upside down, backwards, and be invisible to radar, I’m sure we can build a car that gets 54.5 mpg.]”. There’s no question that we can build a 54.5 mpg car; the question is, can you afford one? This new fuel standard is obviously going to increase the complexity and cost of cars in general, that means less people are going to be able to afford them. How does this help the middle class? Maybe they mean that it will create a new cottage industry of keeping older cars running and on the road; and the middle class can fill those jobs – kinda like Cuba. Another problem is that crash and efficiency standards seem to be working against each other. You might have noticed that the curb weights of cars has significantly ballooned over the past years – all done in the name of safety. Because of this, we have nice solid cars that don’t squeak and rattle like they use to, but the down side is that this kills performance and gas mileage. Its amazing to think that in 1964, a Malibu with an all-iron big block engine and huge physical dimensions could weigh in just over 3000lbs; while my much physically smaller, all aluminum engined 2007 350z comes in at 3400lbs. Though, people did die a lot in accidents back then. It still doesn’t seem to be understood by our government and environmentalists that battery technology will remain dirty and expensive due to the rare and semi-rate elements used in their construction. The Economist recently covered some of the political unrest developing in Mongolia which is being caused by the destruction of ancestral pastures due to the strip mining for lithium – an obvious major element in lithium batteries. Furthermore, just like how places that are unfriendly to the USA sell us oil, the places with lithium might not be much better. Like I said before, currently hybrid cars only exist because they are subsidized. I think our government is betting that the technology will become cheaper so they no longer have to provide subsidies (if they are planning on subsidizing every car, we are in a lot bigger mess). But, since current hybrids are not really getting cheaper, it doesn’t make any sense to impose stricter future requirements. So what about us enthusiasts? I think we are pretty much S.O.L on this one, and this pretty much spells the end of the sports cars that the average Joe can buy. Exotic cars will always be around for the very rich, those already incur the financial penalty for not meeting CAFE standards. I don’t know whats going to happen to the Mustang, Camaro and even the Corvette. They are either going to put tiny engines in them that are near their 100% potential from the factory, or sell much less of them (by making them more expensive) so that the other cars in the corporate fleet can absorb their ‘low’ efficiency and meet the imposed fuel average. But, I do get the feeling that this new fuel standard is simply a political move to try to win back the votes of the far left environmentalists that feel disenfranchised with the Obama Presidency. Jimmy Carter also imposed a stiff fuel average when he was in office – 48 mpg by 1995. Unfortunately for him, he was not in power to see that through. I do believe that the concept of imposing such a strict fuel economy requirement is against American principles and will create many negative unintended consequences. If something like this went into effect, it will definitely reduce the choices you have when buying a car. 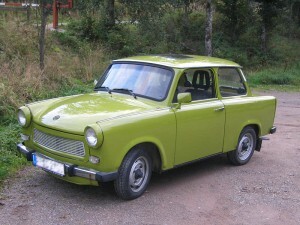 That’s why the picture I posted at the top is of a East German Trabant – the only car you could get if you were an East German.